More ambitious than its predecessor in every area, Shards of Darkness takes our nimble thief out of the shadows of Akenash and into a bigger world with more skills, a greater bestiary, and more intricate, vertical level design. Shards of Darkness benefits from a larger production and better realization, with a story aided by cutscenes in which Styx expresses his trademark wit and snark - get a sneak peek at his sarcastic, fourth wall-breaking humour in this video! You’ll learn why Styx is not the kind of character you're used to playing, and how his wits outweigh his weaknesses. As a goblin, direct confrontation is the best way to kick the bucket, so you’ll have to study your environment to find the best approach and tools to overcome your enemies. Discover how this “ugly little green character” adapts to your playstyle, as “you can be the guy that goes in and out through the level getting every item, or the sneaky one who never raises any alarm.” Take advantage of Styx’s acrobatic prowess and rain down destruction from above, or use your tools and abilities to totally avoid detection – it’s entirely up to you. No matter how you play, he’ll be there for the entire journey, criticizing not only the player, but his creators too! Styx: Shards of Darkness releases on March 14th, 2017 for PlayStation 4, Xbox One, and PC! You can preorder the game now on STEAM to get exclusive access to the Akenash set, donning the outfit and dagger from Styx's first adventure. 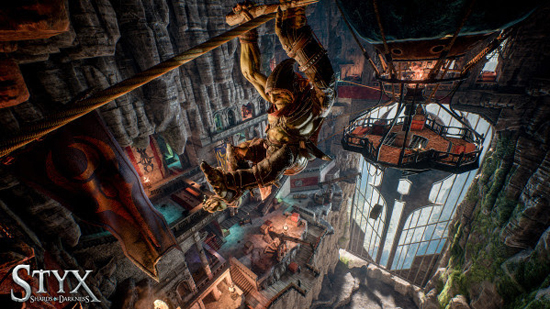 Centuries-old goblin assassin Styx returns in a new stealth game, Styx: Shards of Darkness, with a bigger budget, bigger ideas, and a new engine: Unreal 4. Master of Shadows was a valiant exploration into the world of the green goblin thief, but Shards of Darkness will delve deeper into a complex narrative and fully realized world. Following the fall of Akenash tower, an extraordinary matter has forced Styx out of hiding to infiltrate Korrangar, the city of the Dark Elves. Supposedly impregnable, a diplomatic summit offers Styx a chance at slipping in unnoticed, as he learns that the event is nothing but a mere façade... Embark upon a stealthy adventure with new enemies, new environments, and a plethora of new mechanics aimed at refining the abilities and movement of Styx ; grappling around corners, climbing ropes, and using his trusty knife as a zip-wire. Shards of Darkness aims to offer unparalleled freedom of movement, along with refined stealth and assassination mechanics, expanding and improving on the strengths of Styx: Master of Shadows.